Our calendar of events features all current and future events being held at the Marines' Memorial Theatre. Make sure browse through each event for more information as well as directions on how to purchase tickets! 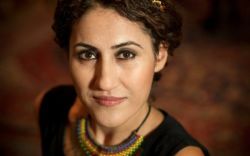 Diaspora Arts Connection proudly presents world-renowned contemporary singer and musician of Kurdish ancestry from Turkey, Aynur. Join us for an evening of Aynur's soulful music. Over the years Aynur has become one of the most well known musicians from Turkey and a representative for the Kurdish people. Her vocal style and her albums have been praised by international media. Her albums are bestsellers in the genre of Kurdish folk music. Aynur’s music is based on traditional Kurdish folk songs, some at least 300 years old. Her lyrics are about the life and suffering of Kurdish people, and in particular, Kurdish women. Musically, she tries to blend Kurdish with Western music, creating her own style and interpreting her traditional repertoire in a modern and fresh way.